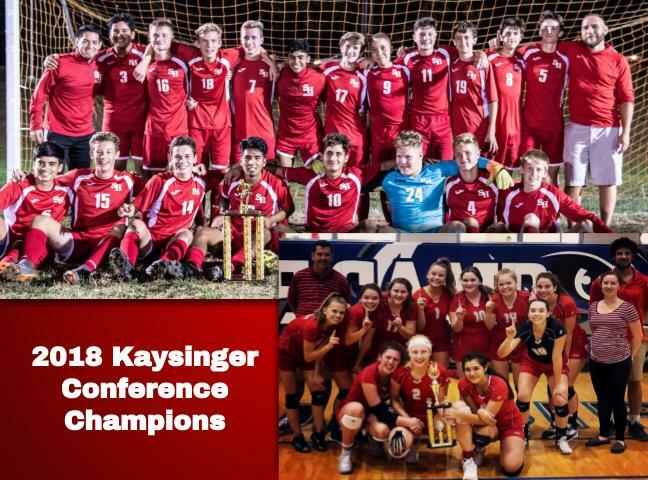 Congratulations to the 2018 Kaysinger Conference Tournament Champions! A pair of goals from Sam Bello led Sacred Heart to its 10th straight Conference Tournament Title. Playing conference rivals Green Ridge for the third time in four years, Sacred Heart withstood an incredible effort from the Tigers. The SH defense of Rollings, Martin, Walker, Ulbrich, and GK Easton Webb continued their improved play as a defensive unit. While the Tigers continually threatened, the SH defense turned each opportunity away. Then in the 23rd minute, Alex Viscarra played a beautiful ball through the Tiger defense and Sam Bello buried the ball in the back of the neck. The Gremlins looked like they would take a goal advantage into halftime, but a communication breakdown on a slow roller through the back allowed a Tiger player to run into the ball and score into the right corner of the net. The second half continued to be a back and forth affair, but senior Francisco Rojas was not going to be denied. Continually playing the entire length of the field, Rojas controlled the game offensively and defensively. With six minutes left in the game, Rojas stole a ball in the middle of the field and played a perfect ball through Tiger defense to Sam Bello who slammed home the deciding goal. The Gremlin defense withstood a furious Tiger rally for the last few remaining minutes to bring home the Championship. Sacred Heart had a strong start in pool play of the Kaysinger Conference tournament. The first match they faced the Smithton Tigers. The first set of the match both teams were going point for point keeping it a close match at 14-14. Then the gremlins were able to go on a run finishing the set 25-15. The second set, the gremlins got an early run and managed to keep the lead finishing the second set 25-12. Zoe Volcko finished the game with 10 kills, 3 aces, 5 digs, and 2 blocks. Maddy McClain had 9 kills, 2, aces, 7 digs, and 2 blocks. Grace Goodwin had 8 digs. The second match of the day was against Otterville. Otterville kept the Gremlins on their toes going point for point and eventually taking the lead 11-10. The Gremlins were able to rally back and took the win in the first set 25-13. The Gremlins won the second set 25-8. The Gremlins will finish off pool play on Saturday against stover before moving on to the tournament play of the Kaysinger Tournament. Zoe Volcko had 4 kills, 1 ace, 3 digs, and 1 block. Kiley Beykirch had 3 kills, 3 aces, and 14 digs. Grace Goodwin had 6 digs.